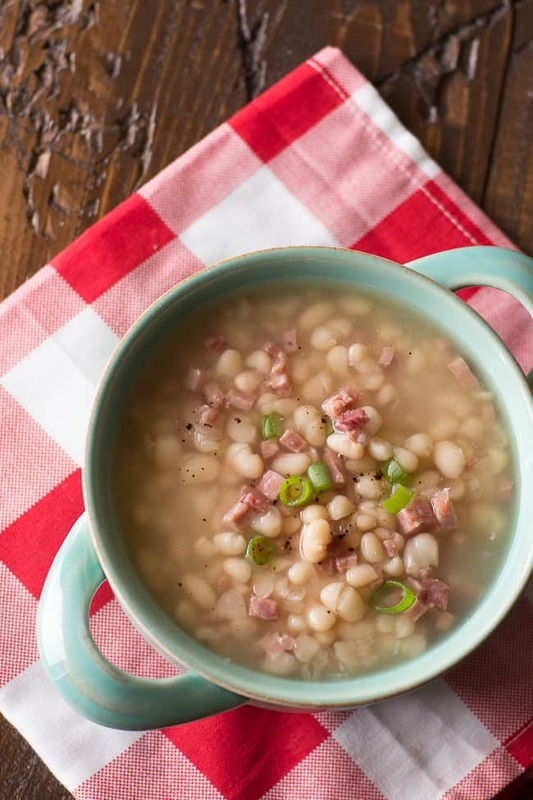 This hearty and delicious navy bean soup recipe is an old family favorite. 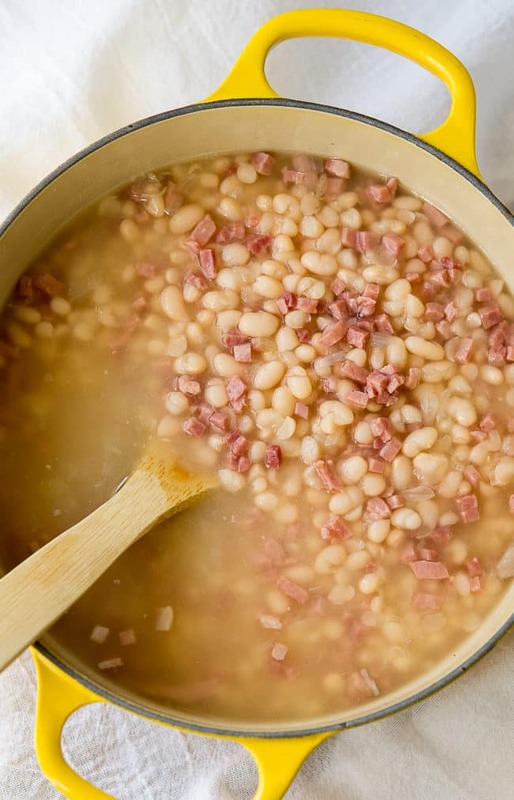 Whenever I smell a pot of navy bean and ham soup simmering on the stove, I think of my childhood and the delicious soup that my grandfather used to make. As I mentioned, navy bean soup and ham makes me think of my papaw. He passed away several years ago, and when I visit him in my memories I can still smell that pot of beans that he ALWAYS had going on the stove. My dad carries on this fondness for navy bean soup and my mom makes this recipe for him at least two or three times a month. 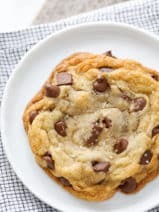 It’s really such a simple recipe but the flavor can’t be beaten. I didn’t love beans when I was a kid, but my appreciation for them has grown over the years. I actually love it when I visit my parents and my mom has a pot of this navy bean soup and ham on the stove. 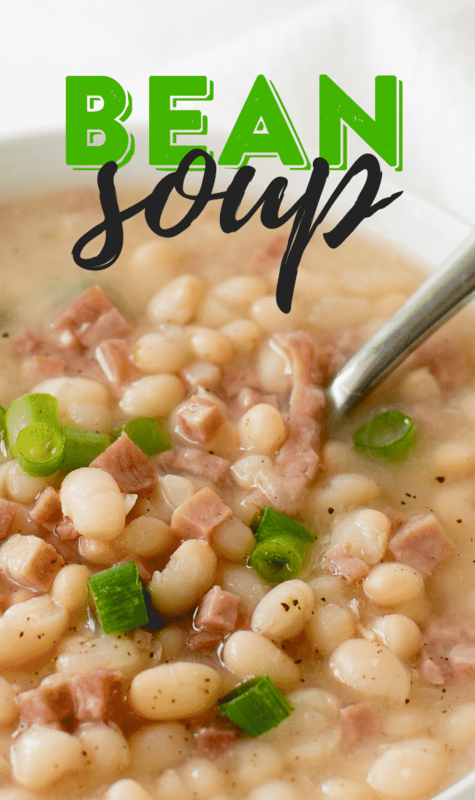 It makes the entire house smell amazing and this ham and beans soup recipe is one of my favorite simple comfort foods. I also love this soup recipe because it’s just so easy to make. 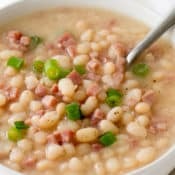 Just three inexpensive ingredients and you have a huge pot of beans to warm a whole bunch of bellies. 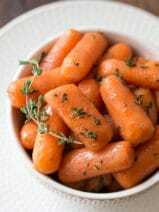 If you’re a regular reader here at Dear Crissy, you may have noticed my affinity for comfort soup recipes. Be sure to check out my 15 bean soup recipe, this delicious Crock Pot lentil soup, and my famous cheesy potato soup. 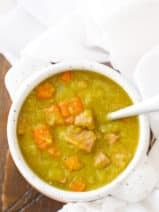 We usually used diced ham in this recipe, but you could also add a ham hock to bump up the flavor. You’re only going to need a few basic pantry ingredients to fix this delicious and comforting soup for your family. Here’s what you should put on your grocery list! Honestly, the real trick to making the perfect ham and bean soup is just letting that pot simmer away. Here’s a good tip. If you’re wondering whether to cook your navy bean soup with the lid on or off the pot, the answer is a bit interesting. I’ve found that I get the best results when putting the lid on the pot but leaving it just slightly ajar. You want the pot to be covered, but with a tilt so steam can still escape the pot. This results in the best, creamiest beans in my opinion! Also, one of the best things about making navy bean soup is dunking a big chunk of cornbread into the bowl. If you’re looking for a fabulous and easy cornbread recipe to make with your soup, you don’t want to miss my easy buttermilk cornbread. This bean soup + my favorite cornbread recipe = one amazing dinner. Oh, and when you’re making this perfect bean soup (or simmering any beans), you’ll want a great dutch oven. This is the one I swear by. 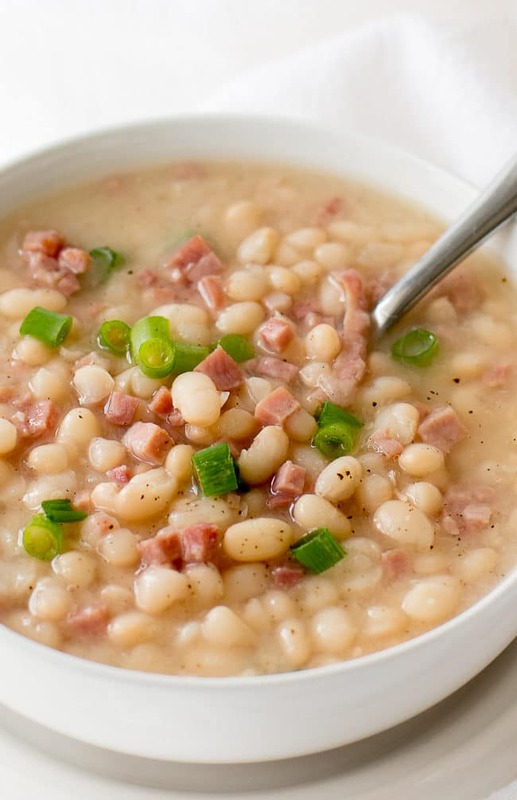 Is Navy Bean Soup Healthy? It’s funny how some things come full circle as you grow up. When I was a kid, I never thought that one day I’d crave my papaw’s navy bean soup. He was a real character and I miss him so much! While I know that beans were a dietary staple in his generation, you may be wondering if this is a healthy dish to prepare for your modern family. The good news is, beans are INCREDIBLY GOOD FOR YOU! Navy beans are a fantastic source of dietary fiber and a very good source of both folate and manganese. Navy beans are also a good source of many minerals including copper, phosphorus, magnesium, and iron. Don’t forget, navy beans are a good source of protein and vitamin B1, too. According to Prevention, eating a cup of any type of beans a day—particularly kidney, navy, pinto, black, chickpea, or butter beans—can lower cholesterol by as much as 10% in 6 weeks. Y’all, you can’t beat healthy comfort food like this! 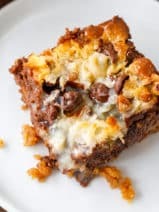 Did your parents or grandparents have any old-fashioned recipes that you grew to love in adulthood? Total Time:2 hrs. 30 mins. 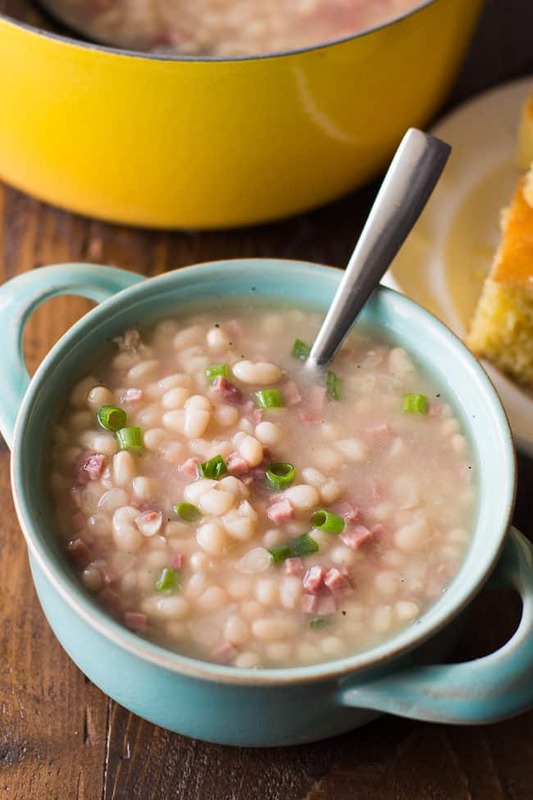 This simple, old-fashioned navy bean soup recipe makes a warm and satisfying family meal. Sort beans and rinse thoroughly. Add beans and 8 cups water to a large pot. Bring to a full boil and boil for 2 minutes. Remove from heat, cover and allow to soak for an hour. Drain and rinse again. Return beans to pot and cover with 6 cups water. Stir in the onion and the diced ham. Simmer with a lid slightly tilted (ajar) for 1 ½ to 2 hours or until desired tenderness. Salt and pepper to taste. Garnish with green onion. I am so happy I found this recipe ! My dad grew up during the depression & bean soup was one of his favorites. Growing up I remember thinking I never wanted to eat it again because he made it so much lol But now I’m 37 & it sounds so good! 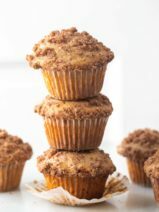 Thank you for posting the recipe, I cant wait to make it. Love ham and bean soup. I use about 2 cups ham broth and the rest water. A more intense ham flavor. Wonder how this would be with northern beans instead and in a slow cooker all day…? Any thoughts? Add a few veggies, a splash of wine and short pasta and here you are with a delicious and comforting dish ! I love a good bean soup. I think the absolute best is using the leftover ham bone from say Easter, or a Holiday dinner. Let the bone simmer away in the beans and like hocks, remove it and bones before serving maybe breaking up any large ham pieces if needed. I have found too, you can freeze a hambone easily. 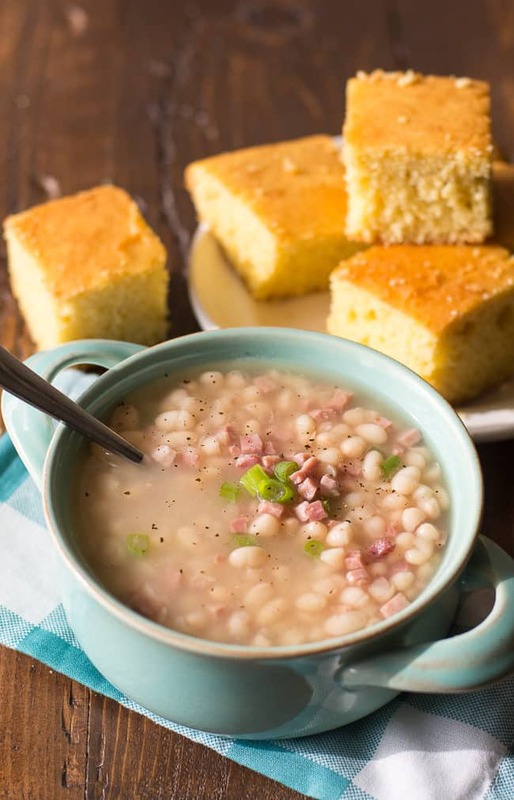 I have also been known to ask for the hambones if we eat elsewhere (I am shameless about bean soup and not many like the hassle they use cubes )I have to agree, bean soup and a cornbread can’t be beat! Ellen, I have no doubt that you are right about that ham bone!!! We’ve done it that way before too but rely on the quick method as well. :) Thanks for commenting, glad to see you’re still reading! One of our families fave for decades. My daddy grew up eating this. Depression era poor food..no ham though.